I recently did a post on lip & cheek stains, and was recommended to try the Beauté liqui gel stain as the consistency was different to the average lip and cheek stain. The colour as you can see is SO bright, pigmented and very neon orange. It becomes quite sheer once totally blended, and leaves a lovely peachy coral stain. It gives a subtle dewy creamy finish which looks lovely on the apples of your cheeks. It no way feels oily or greasy. 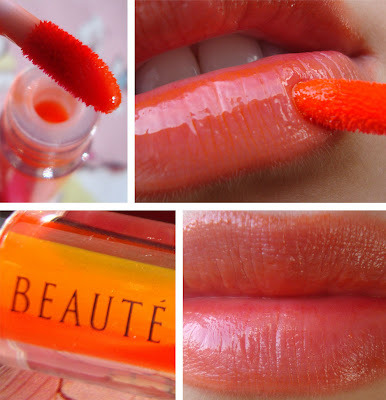 On the lips, it turns into a orange/coral colour that isn't as bright as the tube. It can be layered once dry to achieve a more intense colour. It can be worn under or over lipgloss or lipstick to achieve your desired look. The photos below are with one coat of the 'Neon' liqui gel stain. This is by far the best lip and cheek stain I have ever tried and well worth the £'s. It's priced at £24.50 on Coco Beau, roughly the same price as BeneTint. This product will be getting lots of love in the summer, where I wear a tinted moisturiser and probably just this on my cheeks. Ahhhh I can't wait for Summer!! Bring it on! Liqui gel stains available in 4 shades. Disclaimer: This product was sent to me for review, I was not paid for this post & I am not affiliated with the brand. This is my honest opinion as always. Beautiful. Way out of my price league though! Oooh! Looks very lovely! Will have to check this stuff out! I love this! I first saw it on Pixiwoos Sam, and her YouTube vid for an easy 10 min make up and she looked gorgeous wearing it! I have been wanting to purchase it but couldnt justify the money and the shipping from the US but now they have a uk website, Perhaps i should treat myself! Especially now that you recommend it! Your posts are always so spot on, you seem to mind read the items i want to purchse and do excellent reviews on them! Thank you! Oooh can you layer it to get as neon as it is in the tube? @Lillian Funny Face - Yes, as long as you wait for each layer to dry before layering. Beautiful colour. I'd love to see what this looks like on a darker skin tone too. I am SO coveting Beaute products. I want them all. THIS IS SOOOO ME!! I must get it! It goes to show that you shouldn't judge colours as they appear straight in the packaging! It looks so scarily fluorescent in the tube, but surprisingly more wearable in your swatch! Wow, I have to try this one, it looks so good on you! This looks amazing against your skintone! I love the look of it once blended, much less scary! Sigh, I wish I could justify the price!